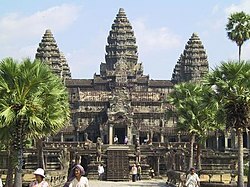 Teampall Angkor Wat, (12na linn), an teampall as motha air feadh an t-Saogail. Is e àite neo togalach aoraidh a tha ann an teampall. Cha bhi iad gu h-àbhaisteach Crìosdail neo Muslamach, agus cha robh ach fear aig na Iùdhaich a bha ann an Ierusalam. Far a bheil ainm-àite “Teampall” ann an Alba, is minig a bha àite aig na Teamplairean; is “Ballintrodach”, neo “Baile nan Trodaich”, an t-seann ainm aig “Temple” ann an Meadhan Lodainn. Air a tharraing à "https://gd.wikipedia.org/w/index.php?title=Teampall&oldid=476694"
Chaidh an duilleag seo a dheasachadh 11 dhen Dàmhair 2014 aig 22:21 turas mu dheireadh.